... The fashion is for coiffures à la chinoise so high that, even with the longest hair, it is difficult to create them. M. Palette has created false coques* of hair; and, with this accessory, or a part of it, for the coques come apart, one can create the highest chinoises. Five coques are sold for twenty-five francs. M Palette resides at the passage of the Petits-Pères, number one. 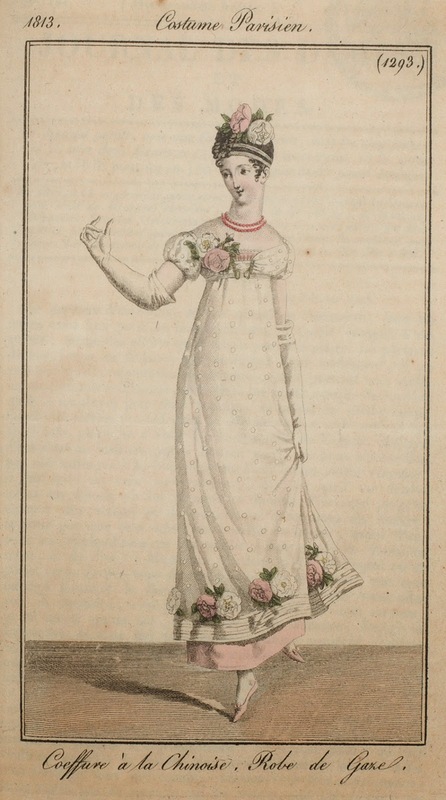 For balls, seamstresses sew satin motifs on tulle gowns, made in the shape of a peak or trefoil, and fold down their edges: they put a garland of flowers at the bottom of the gown, and above the garland a double rouleau of satin. Gowns are called à la Vierge or à la demi-guimpe if they are as high-cut as those seen in church paintings. These new gowns are made in emerald green and white striped gauze, or lapis lazuli blue and white; the trim of the top and bottom consists of a bouillonné band of gauze made in reverse box pleats. * Literally "shell"; those flattened loops you see in hairstyles of the 1810s through 1830s.